Today, we had a short 57-mile run to the western edge of Lake Michigan. This really is the Land o’ Lakes — we rode past dozens of them. We also rode through small towns with names like St. Peter, Marytown, Calvary, and St. Paul. Apparently, locals refer to this area as the “holy land”. I swear that one town consisted of nothing but a church and a bar. Fond du Lac means foot of the lake (not bottom of the lake) — it’s the southernmost point on Lake Winnebago — a large but very shallow body of water. For me, it’s a huge lake but that’s because I’m from Colorado where we don’t get many lakes. Despite its surface area, Lake Winnebago is only 12 feet deep on average. 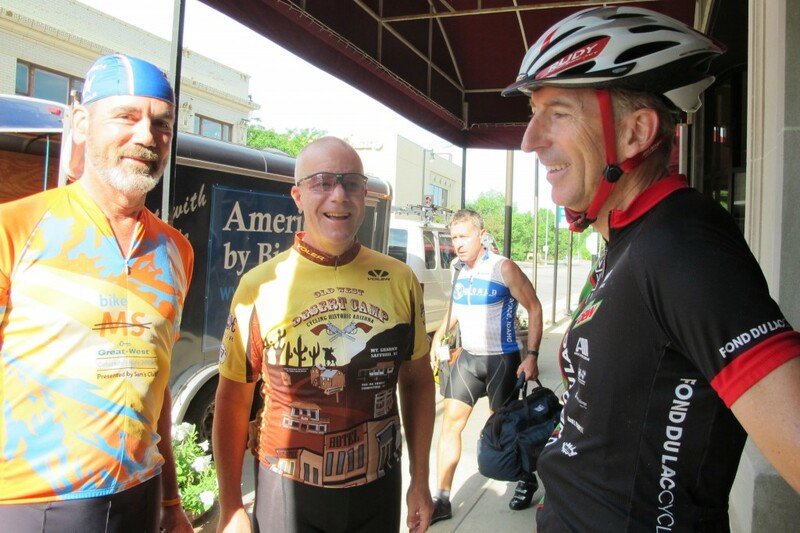 Our new friend, Dave Hornung (who took us on the pontoon boat last night), rode with me this morning and described a bike race he helps organize around Winnebago. It’s called Race the Lake, it’s 90 miles long and it’s coming up on August 21. They’re expecting 1,600 riders this year so register soon at http://bit.ly/qRl7g0. We also caught up with another Dave today — Suellen’s brother, Dave Sebald and his wife Fran. They visited us with their friends Betty and Lou Benedetto. Better yet, the four of them set up a SAG stop for all of us with snacks, cold drinks and good hospitality. We all enjoyed a short break and then I rode on with Dave and Fran to Manitowoc — right on the edge of Lake Michigan. Tomorrow, we take a ferry across the lake and arrive in our seventh state – Michigan, where we also lose another hour. I guess that’s a milestone — we’ll be on our fourth time zone tomorrow. You’re having a lot more fun than I thought was possible on such a gruelling adventure. Maybe I need to get myself a bike.